4026 1832 Laser Hot Hits. Vangelis "Chariots of Fire", fair-good signal. SINPO 34333. 6240 1825 Radio Bohemia Int. IDs and email address, electronic music. SINPO 34333. 6255 1820 Radio Telstar South. Old adverts ... Green Cross Code, Stylophone, Sharps mints. SINPO 44433. 6289 1815 Pirates For Peace. Rap music, ID and email address, fair signal. SINPO 34333. 6307 1805 Bogusman. Roger Waters "Run Like Hell," talking about his neighbours. Strong. SINPO 54444. 6325 1742 Radio Lowland. Barrel organ and polka music, good signal. SINPO 44433. 6525 1748 Radio Pink Panther. IDs, Nirvans "Smells Like Teen Spirit," and Pussycat "Smile." SINPO 34333. 6942.5 1845 IMR. Slight change of frequency, T Rex "Children of the Revolution," ID. Fair signal. SINPO 34333. 6967.5 1753 Laser Hot Hits. "I Can't Believe It's Over." Fair signal. SINPO 34333. 4026 0758 Laser Hot Hits. Kane Gang "Closet Thing to Heaven." good signal. SINPO 44433. 6211v 0755 Radio King Shortwave (tent). Modulation seems to be getting worse, distorted signal. SINPO 34332. 6238 1820 Radio Osaka. Dutch song, ID and greetings. Fair signal. SINPO 34333. 6240 1710 Radio Zeewolf. "Dragon Slayer", ID, testing. Fair signal. SINPO 34333. 6255 1910 Radio Telstar South. "God Gave Rock & Roll", strong. SINPO 54444. 6280 1610 Cosmic Radio. ID jingle, rock music. Fair-good. SINPO 44433. 6285 0747 Radio Focus Int. Simon & Garfunkel "The Boxer," fair signal. SINPO 34333. 6295 1600 Radio Witte Reus. Depeche Mode "Leave in Silence" then Europe "The Final Countdown." SINPO 34333. 6305 1524 Radio Quintus. Polka, ID and email address. Good signal. SINPO 44433. 6305 1705 Radio Python. ID, instrumental music. Weak-fair. SINPO 24332. 6305 1905 Cupid Radio. Billy Idol "Eyes Without A Face", ID and off. Strong. SINPO 54444. 6325 1837 Radio Boomerang. ID then Frankie Goes to Hollywood "Relax." Very strong. SINPO 54444. 6425 1830 Sundown Radio. Dance music, fair. SINPO 34333. 6525 1545 Radio Pink Panther. Status Quo song. Fair. SINPO 34333. 6920 1815 Trans Europe Radio. ID, greetings, Stranglers "No More Heroes." Strong. SINPO 54444. 6940 1535 IMR. "Your Love is Lifting Me Higher and Higher," then ID. SINPO 34333. 6967.5 0740 Laser Hot Hits. Janet Jackson "Runaway," good signal. SINPO 44433. 6985 1640 Mike Radio. "Everytime I Think of You," ID jingle, Marillion "Kayleigh." Strong. SINPO 54444. 3955 2220 BNL Rock Radio via Radio 700. The Cure "Boys Don't Cry," good signal, some fades. SINPO 44433. 4026 2052 Laser Hot Hits. Dave Norris talking about trip to seaside, Human League songs. SINPO 34333. 6247 2040 Radio Ascona. Move from 6326, Status Quo, occasional bursts of utility. SINPO 43433. 6285 2020 Radio Focus Int. Scaffold "Lily the Pink", fair signal. SINPO 34333. 6295 2005 Radio Powerliner. Greetings and instrumental music, off a few minutes later. SINPO 44444. 6305 2015 Radio Lowland. "Only the Lonely" then "Save the Last Dance for Me." Strong signal. SINPO 54444. 6326 2010 Radio Ascona. IDs and polka music, some utility QRM. SINPO 33333. 6940 2035 IMR. Bob Seger song, utility QRM (6939). SINPO 43433. 6967.5 2030 Laser Hot Hits. Another slight frequency tweak but some splash from Galei Zahal on 6973. Dance music. SINPO 33333. 4026 1945 Laser Hot Hits. Beach Boys "That's Why God Made the Radio." Fair-good signal. SINPO 44433. 6325 1938 Radio Zodiac. ID and giving contact details, then "Running With the Devil." Fair. SINPO 34333. 4026 2030 Laser Hot Hits. Ian Lawrence talking about his holidays, The Beatles "Norwegian Wood." SINPO 34333. 6291 2010 Radio Caroline Int. ID jingles, choral music. Fair signal but utility QRM. SINPO 33333. 6966 2020 Laser Hot Hits. Oldies, weak signal. SINPO 24332. 4026 1937 Laser Hot Hits. Paul Stuart programme. "Dancing the Night Away," fair signal. SINPO 34333. 6289 1925 Pirates for Peace. ID and "Give Peace A Chance", then slow song. Good signal. SINPO 44433. 6325 1915 Radio Galaxy. Dance music, fair signal, heterodyne from another weaker signal. SINPO 33333. 6966 1933 Laser Hot Hits. Oldies, weak signal. SINPO 24332. 4026 2050 Laser Hot Hits. Mike Andrews programme. Oldies, fair signal. SINPO 34333. 6280 2005 Pirates For Peace. Relay of Pirating With Cumbre programme, fair signal. SINPO 34333. 6305 2017 Radio Osaka. Greeting Gino, Italian song. Weak-fair. SINPO 24332. 6966 2030 Laser Hot Hits. Oldies, weak-fair signall. SINPO 24332. 4026 1110 Laser Hot Hits. Huey Lewis & The News "This is It." Fair. SINPO 34333. 6005 0835 European Music Radio via Radio 700. Mailbox show, reading listeners' letters, unusually strong SSB QRM on same frequency. SINPO 33333. 6045 0915 XVRB via Wertachtal. Rock n roll, good signal but some fading. SINPO 44433. 6140 0900 Radio Gloria via Issoudun. Sign on, Justin Hayward "Forever Autumn." SINPO 44433. 6205 0745 Radio Orang Utan. Dutch songs and IDs. Fair. SINPO 34333. 6213 0843 Radio King SW. Oldies, poor modulation. SINPO 34332. 6240 0755 Unid. Rock music, weak signal. SINPO 24332. 6240 1048 Radio Zeewolf. Signing off, "Dragon Slayer." SINPO 24332. 6247 1745 Ascona Radio. Dutch songs, ID, some utility QRM. SINPO 33333. 6280 1707 Cosmic Radio. Everley Brothers "Cathys Clown," ID jingle. SINPO 24332. 6285 1035 Radio Powerliner. "Floral Dance" and other instrumental music. Fair. SINPO 34333. 6285 1750 The Ghoul. Capt Sensible "Glad It's All Over," giving out email address and asking for interesting reception reports. Strong. SINPO 54444. 6291 1735 Radio Caroline Int. Greek music, splash from Reflections Europe. SINPO 23332. 6305 0825 Radio Altrex. Greetings and chat, oldies. SINPO 34333. 6305 0945 Radio Sallandse Boer. Dutch music and ID. Fair. SINPO 34333. 6305 1700 Radio Osaka. Steeleye Span "All Around My Hat," SINPO 34333. 6325 1650 Radio Merlin Int. Relay of Radio Caroline, fair. SINPO 34333. 6450 1725 Radio Universe. Gerry Rafferty "Baker Street," fair signal. SINPO 34333. 6525 1715 Radio Pink Panther. Moody Blues "Nights in White Satin." SINPO 24332. 6940 1125 IMR. Oldies, weak signal. SINPO 24332. 6966.5 0830 Laser Hot Hits. Instrumental tune, ads for FSN News and Offshore Echos. SINPO 34333. 7265 1139 Radio Gloria via MVBR. Giving out address, All About Eve song. SINPO 34333. 18950lsb 1135 Baltic Sea Radio. "Lambada" song, canned ID and email by woman and off, utility QRM. SINPO 23332. 3905 2145 Radio Underground. Country song then Focus "Hocus Pocus." SINPO 34333. 4026 0900 Laser Hot Hits. ABC "Tears Are Not Enough", fair signal. SINPO 34333. 6085 0923 BNL Rock Radio via Radio 700. Killing Joke "Love Like Blood", fair. SINPO 34333. 6095 0937 KBC via Wertachtal. Country rock, good signal. SINPO 44433. 6212 0845 Radio King SW (tent). Oldies but usual bad modulation. SINPO 34332. 6240 1935 Radio Underground. Chat, mention this blog (thanks), Dutch song. Strong. SINPO 54444. 6255 1730 Radio Geronimo SW. "Give It All For Rock," strong signal. SINPO 54444. 6280 1619 Cosmic Radio. ID, song by Muse, said also on FM, still no contact address. SINPO 34333. 6284 1655 Radio Altrex. Oldies, splash from Cosmic. SINPO 23332. Heard on 6287 at 1702, better signal and less QRM. SINPO 34333. 6290 1809 Radio Rainbow. A version of "Somewhere Over the Rainbow" then some Beatles songs. Good signal. SINPO 44433. 6301 1625 Radio Sallandse Boer. Instrumental music, OMD song, ID and Dutch talk. SINPO 44433. 6326 1800 Radio Caroline/Rainbow. Weak signal but IDs heard and pop music. SINPO 24332. 6525 1632 Radio Pink Panther. "La Bamba", ID and greetings. SINPO 34333. 6940 1642 IMR. Elton John "I'm Still Standing." Good signal. SINO 44433. 6965 0853 Laser Hot Hits. Kate Bush "Running Up The Hill." Fair. SINPO 34333. 4026 2042 Laser Hot Hits. Dance music, fair signal. SINPO 34333. 6070 2050 Radio 6150. Non-stop 60s music, good signal. SINPO 44433. 6240 1728 Radio Sluwe Vos. Dutch songs, off after few minutes. Good signal. SINPO 44433. 6268 1733 Radio Luxemburg. Dutch instrumental music, ID jingle then "Groovy Kind of Love." Strong. SINPO 54444. 6285 1720 Radio Black Arrow. The Sweet "Ballroom Blitz," greeting listeners in the chat. SINPO 44433. 6295 2035 Radio Spaceshuttle. IDs heard and music, weak signal. SINPO 24332. 6305 1635 Radio Merlin Int. Meat Loaf "I'd Do Anything For Love," ID jingle, DJ Nellie. Fair signal. SINPO 34333. 6940 1645 IMR. Suzi Quatro & Chris Norman "Stumbling In," good signal. SINPO 44333. 6965 1655 Laser Hot Hits. "Lady Linda" then "Closest Thing to Heaven." Occasional short utility bursts, anyone know what that permanent carrier on 6960 is? SINPO 34333. 3955 2207 BNL Rock Radio via Radio 700. ID jingle, Nirvana "Smells Like Teen Spirit", strong. SINPO 54444. 6965 2150 Laser Hot Hits. Howard Jones song, fair signal. SINPO 34333. 3955 2213 BNL Rock Radio via Radio 700. Giving out contact details, Zombies "She's Not There." SINPO 44433. 4026 2210 Laser Hot Hits. Icehouse "Hey Little Girl," fair signal. SINPO 34333. 6285 1645 Radio Osaka. ID jingle, George McRae "Rock Your Baby" then a Dutch song. Weak with fair peaks. SINPO 24332. 6940 1706 Irish Music Radio. Songs by Clodagh Rodgers and Marianne Faithful, ID, fair signal. SINPO 34333. 6965 1700 Laser Hot Hits. Dance music, fair-good signal. SINPO 44333. 4026 2030 Laser Hot Hits. Dave Norris live broadcasting. Diana Ross "I'm Coming Up", talking about sound card problems. SINPO 44333. 6210 1750 Radio ACDC. Rock music, fair signal. SINPO 34333. 6273 1705 Radio Luxemburg (tent). The Cure "A Forest" then "Crazy on You." SINPO 54444. Moved to 6290 at 1715. SINPO 54444. 6965 1545 Laser Hot Hits. Dave Norris show. Depeche Mode "See You," good signal. SINPO 44433. 4026 2020 Laser Hot Hits. Aztec Camera song, fair reception. SINPO 34333. 6070 1720 Radio 6150. Radio Caroline recordings, some splash from nearby stations. SINPO 43433. 6240 2010 Sluwe Vos Radio. Dutch song then off before returning few minutes later. SINPO 54444. 6275 1725 Radio Luxembourg (tent). "I've Found My Freedom" then "Glass of Champaigne." SINPO 54444. 6285 1635 Radio Omejan. Dutch songs, utility QRM. SINPO 43333. Moved to 6305 at 1638, SINPO 44433. 6295 1625 Radio Osaka. Polka and instrumental music, ID and email address. SINPO 34333. Heard on 6303 at 1740 with SINPO 34333. 6965 1655 Laser Hot Hits. Songs from Joss Stone and David Grant. SINPO 34333. 3905 1815 Skyline International Radio. Joint show with Radio Black Eagle. Alphaville "Forever Young," then Scorpions "Winds of Change," fair signal. SINPO 34333. 4026 1810 Laser Hot Hits. Talking about Twitter, dance music. SINPO 34333. 6291 1805 Radio Caroline Int. Dance music, jingle IDs. SINPO 34333. 6305 1748 Radio Python. ID and email address, alternative music. SINPO 34333. 6425 1755 Radio Golf Victor. ID and greetings, Dutch songs. Good signal. SINPO 44433. 6940 1735 Irish Music Radio. Dance music, fair signal. SINPO 34333. 6965 1740 Laser Hot Hits. Bananarama song, fair. SINPO 34333. 4026 2035 Laser Hot Hits. Dance music, better signal tonight. SINPO 44433. 5805 1743 Radio Relmus. Simon & Garfunkel "I Am A Rock." Weak-fair. SINPO 24332. 6210 1800 Radio ACDC. Soft rock, fair. SINPO 34333. 6240 1740 Radio Luxemburg. "Give A Little Bit," good signal. SINPO 44433. 6284 1752 Radio Altrex. Dire Straits "Money For Nothing." Fair. SINPO 34333. 6300 2005 Radio Powerliner. Dutch music, then instrumental and report to Sallandse Boer. SINPO 54444. 6300 2013 Radio Sallandse Boer. Report for Powerliner. Strong. SINPO 54444. 6305 1630 Radio Osaka. Ram Jam "Black Betty," weak-fair signal. SINPO 24332. 6965 1620 Laser Hot Hits. Charlene "I've Never Been To Me" then Hall & Oates "Private Eyes." SINPO 34333. 4026 2012 Laser Hot Hits. Dario G "Life in a Northern Town," fair. SINPO 34333. 6070 2020 Radio 6150. Radio Caroline recodrings, good signal. SINPO 44433. 6300 1955 Radio Golfbreker. Dutch & country music, ID and talk in Dutch. SINPO 44433. 6320 2030 Radio Zodiac. IDs, said testing, ZZ Top "Gimme All Your Loving." SINPO 44333. 6965 2005 Laser Hot Hits. Oldies, weak-fair. SINPO 24332. 4026 2015 Laser Hot Hits. Dance music, fair signal. SINPO 34333. 6290 1948 Radio Luxemburg. The Cure "A Forest", a few audio problems to start with but soon fixed. Good signal. SINPO 44444. 6305 1908 Radio SWR. The Sweet "Dynamite" then "Summer of 69" Bryan Adams. SINPO 34333. 6965 2005 Laser Hot Hits. Kid Creole "Stool Pigeon", weak signal. SINPO 24332. 6070 2025 Radio 6150. Recordings of Radio Caroline, good signal. SINPO 44433. 6965 2000 Laser Hot Hits. Tony James show, reading report from Russia, oldies. SINPO 24332. A nice surprise in my inbox with the arrival of this QSL from the legendary Bogusman whose backroom team is busy sending out QSLs. Always an enjoyable listen and worth tuning in! Many thanks. 4026 2035 Laser Hot Hits. Talking about powerline communications, "Dirty Cash", fair-good. SINPO 44333. 6204 1902 Bluestar Radio. ID and Dutch music, strong signal. SINPO 54444. 6240 2000 Sluwe Vos Radio. Michael Jackson "Thriller", ID jingles. Strong. SINPO 54444. 6255 1905 Radio Telstar South. Moody Blues "Nights in White Satin", IDs, strong. SINPO 54444. 6266 1735 Radio Altrex. XTC "Senses Working Overtime", Marillion "Kayleigh", SINPO 34333. 6285 1730 Radio Focus Int. ID, email, Beach Boys "Wouldn't It Be Nice," strong. SINPO 54444. 6305 1725 Radio Merlin Int. Eurythmics "Sweet Dreams", SINPO 44433. 6305 1950 Radio Spaceshuttle. Soul music, IDs and email. Fair reception. SINPO 34333. 6525 1911 Radio Pink Panther. Elvis Presley "Teddy Bear." SINPO 34333. 6940 1930 IMR. Beyonce song, fair-good. SINPO 44333. 6965 1945 Laser Hot Hits. Dave Norris programme. Blondie "Heart of Glass." SINPO 34333. 3905 2000 Radio Techische Man. ID and talk in Dutch, oldies. Fair signal. SINPO 34333. 4026 2010 Laser Hot Hits. Talking about who's on air each night, dance music. Fair-good. SINPO 34333. 6210 1450 Radio Sluwe Vos. Johnny Cash music, weak with fair peaks. SINPO 24332. 6240 1915 Sluwe Vos Radio. The Animals "House of the Rising Sun," good signal. SINPO 44433. 6240 2015 Free Radio Victoria. Kim Carnes "Bette Davis Eyes" ID then Foreigner "Waiting for A Girl Like You." SINPO 44444. 6255 1935 Radio Geronimo SW. Co-channel with Telstar South, both similar strength cancelling each other out! According to listeners in the Pirate Chat, Geronimo was first on 6255. 6255 2020 Radio Telstar South. Geronimo now off so Telstar in clear playing old commercials. SINPO 54444. 6285 1415 Radio Focus Int. Human League "Don't You Want Me", ID and contact details. Fair-good. SINPO 34333. 6295 1500 Voice of the Netherlands. Back after a long time, Toni Arthur "Mickey", fair. SINPO 34333. 6295 1925 Bogusman. Alternative music and chat, mainly about "The Wrinklies." Very good signal, running 200W tonight. SINPO 54444. 6305 1520 Radio Fox 48. Oldies, weak-fair. SINPO 24332. 6305 1930 Radio Merlin Int. The Move "Goodbye Blackberry Way." Good signal. SINPO 44444. 6930 1440 Irish Music Radio. Adele "Someone Like You," weak-fair. SINPO 24332. 6950 1920 Trans Europe Radio. Electro-pop, fair signal. SINPO 34333. 6965 1428 Laser Hot Hits. Queen "Radio Ga Ga", occasional bursts of utility. SINPO 24332. 4026 2045 Laser Hot Hits. Dave Norris talking about putting up aerials, Soft Cell "Say Hello Wave Goodbye." Strong. SINPO 54444. 6284 2030 Radio Altrex. ID and said signing off, B52s song. SINPO 34333. 6304 2035 Radio Spaceshuttle. IDs, punk music. SINPO 34333. 6305 1650 Radio Osaka. Polka music, weak with fair peaks. SINPO 24332. 6965 1635 Laser Hot Hits. New frequency, Paul Stuart giving out contact details, talking about radios he's owned, music from Surita and Moby. Occasional bursts of utility but certainly better than 6915. Fair with good peaks. SINPO 34333. 4026 2050 Laser Hot Hits. Dance music, fair-good signal. SINPO 34333. 6281 1915 Radio Python. Eminem, alternative music, good signal. SINPO 44433. 6290 2015 Pirates for Peace. Canned IDs, David Bowie "Let's Dance." SINPO 44444. 6300 2004 Radio Golfbreker. ID and email address in Dutch, polka and Dutch songs. SINPO 34333. 6300 2034 Cupid Radio. Greeting listeners, ID, rock and pop. Strong. SINPO 54444. 6320 1905 Unpredictable Radio. Pop music, IDs, having audio problems. SINPO 34333. 6915 1945 Laser Hot Hits. Fair signal but blocked by loud heterodyne. SINPO 32332. 4026 2040 Laser Hot Hits. Oldies, fair-good signal. SINPO 34333. 6070 2050 Radio 6150. Radio Caroline recordings, fair-good signal. SINPO 34333. 6284 2025 Radio Altrex. Serge Gainsbourg "J'Taime", fair. SINPO 34333. 6300 2005 Radio Powerliner. Oldies, ID and greetings, then polka. SINPO 34333. 6915 2020 Laser Hot Hits. Oldies, weak and noisy signal. SINPO 24332. 4026 2135 Laser Hot Hits. Back on the air, dance music, good signal. SINPO 44333. 6070 2150 Radio 6150. Announcing in German & English a new station launching soon, then Radio Caroline recordings. Good signal. SINPO 44433. 6300 2145 TRX Radio. Blues and oldies music, occasional IDs. Fair. SINPO 34333. 6085 1735 Radio Marabu via Radio 700. IDs and talk in German, rock music, fair signal but splash from 6280. SINPO 33333. 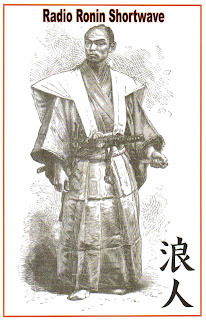 6210 1110 Radio Marabu. Stranglers "Skin Deep", IDs and talk in German, fair-good signal but overmodulated. Also on 6005/6085 but both these weak at this time. SINPO 34333. 6215 1745 Radio ACDC. Rock music, fair but splash from 6210. SINPO 33333. 6240 2050 Radio Witte Reus. IDs and greetings, instrumental tune "Dragon Slayer." SINPO 34333. 6255 2045 Radio Telstar South. Procul Harem "Nights in White Satin." SINPO 54444. 6280 1705 Radio Osaka. Dutch songs and polka, weak with fair peaks. SINPO 24332. 6290 1800 Radio Lowland. Dutch song, fair signal but quite fady. SINPO 34333. 6305 2033 Radio Spaceshuttle. Frequents IDs, Modern Talking. Weak with fair peaks. SINPO 24332. 6320 2025 Radio Caroline Int. Greek music, IDs, whistle on signal. SINPO 33333. 6565 2035 Radio Powerliner. Kraftwerk music, good signal (but not strong as usual). SINPO 44433. 6915 2055 Laser Hot Hits. Underneath some sort of utility noise, maybe should give up on 43m as there seem to be so many utilities there now! SINPO 32332. 6930 1725 IMR. Robert Miles "One on One," weak-fair signal. SINPO 24332. 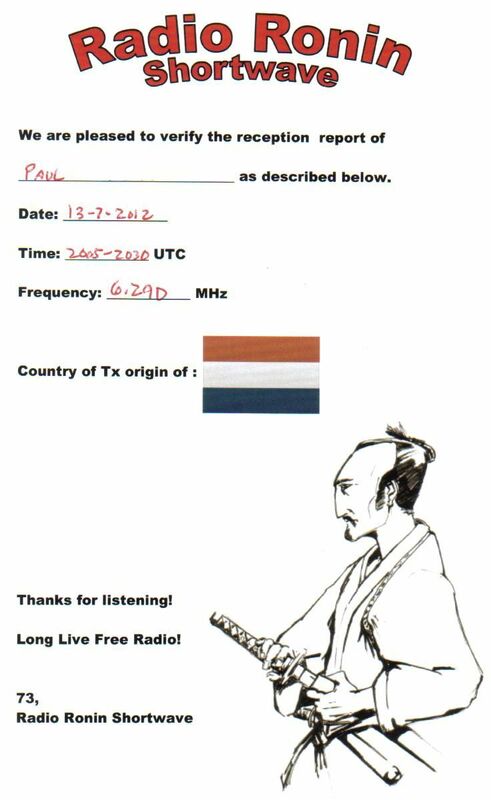 Received a QSL in the post this week from North American free radio station Radio Ronin Shortwave, relayed via a Dutch transmitter in July. Thanks very much.